Laptop power problems are usually caused by a faulty Laptop Power Jack. 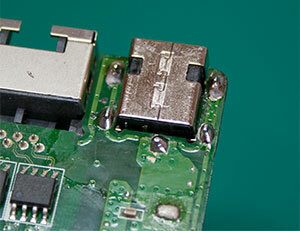 Laptop power jacks are also known as DC jack, power socket etc. Due to the portable nature of laptops, the power jack component is put under high stress during its lifetime from repeated unavoidable tugging and pulling. This stress can cause the power jack to wear out, which may cause your laptop to only charge when holding the power connector at a specific angle, or it may not charge at all. Usually the laptop power jack socket will require replacement, however on occasions simply re soldering the existing power jack can fix the issue. Most modern electronics are assembled with lead free solder, unfortunately while lead free solder is good for the environment it does not make for durable connections. We can repair or replace most laptop power jack sockets, including loose power jacks, laptop power jacks with broken or bent pins, even laptop power jacks which have completely broken off or snapped by re soldering a new laptop power jack. At Milton Keynes Computers we use only the highest quality of tools including Electrostatic Discharge safe soldering irons, work mats, screwdrivers and hot air soldering equipment should it be required in some cases. Fast turnaround, typically 3 working days.